I am using a PB137 battery-charger chip as a float-charger for a 12V 4.5AH Sealed Lead Acid Battery. I started by using the circuit shown on page 5 (Section 3 Application) of the PB137 Data Sheet (see: http://www.kynix.com/uploadfiles/pdf65976/PB137ACV.pdf), where it holds the float voltage at 13.70V. That works as advertised. 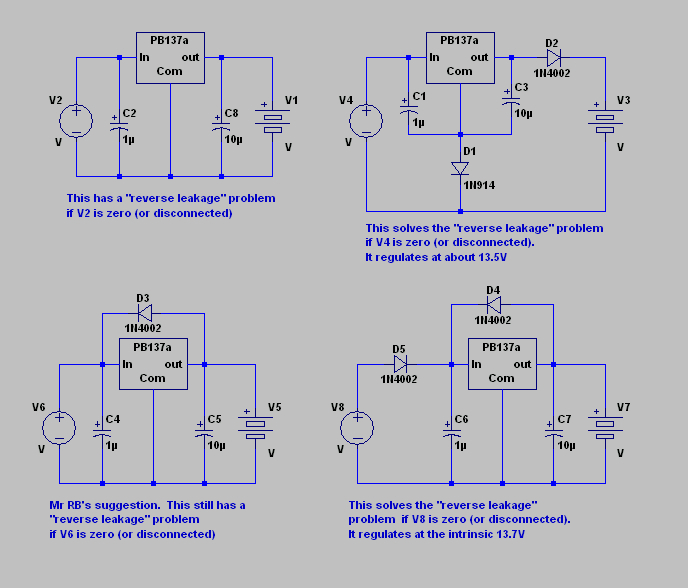 I have encountered a problem which runs contrary to the advertised feature that "Reverse leakage current less than 10uA" as shown on page 1 of the DS and Irev Reverse Leakage Current shown in Table 4. For testing, I have used a current-limited regulated DC bench supply set to about 18V for the input source. I added the bypass caps as shown in the applications schematic. I connected the output to the SLA, and the charging current tapers nicely toward zero as the battery accumulates charge, settling out to near 13.70V. However, the problem shows up if the input supply is disconnected (or set to zero volts). The DS implies that this is ok; that the current that flows backwards from the battery into the output terminal of the PB137 should be less than 10uA. What actually happens is that the initial reverse leakage current is about 50mA, which then rapidly increases to over 0.4A as the PB137 goes into thermal runaway and meltdown. The energy to blow up the PB137 comes from the battery. This is not a fluke; I have blown up three PB137s in an attempt to understand on what is going on. They all got seriously hot, melted and now show a short between all three leads. These were all from the same batch of ten ST branded parts that I bought from Digikey. So my question for the forum: has anybody else experienced this? I have a workaround but it is not too elegant. I added a Si rectifier (1N4002) in series with the output lead (cathode toward the battery), which drops the output voltage by about 0.7V, but prevents any reverse current from flowing from the battery into the regulator output. The data sheet makes this claim for Vi=floating (disconnected), which is not equivalent to setting the power supply to zero volts. I would put the diode in series with the input power supply, not the regulator output. If the device is to be used with a solar panel, then a series diode already has to be in place. Problem solved. Agreed, the data sheet should specify that the device will be destroyed in the absence of such series protection.